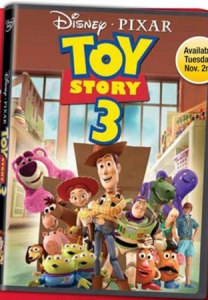 Centsible Savings: $8.00 coupon for Toy Story 3! Toy Story 3 just released today! Print a $8.00 coupon for the Toy Story 3 Blu-Ray combo pack. I was just at Wal-mart and the Blu Ray combo pack was priced at $29.96 making it $21.96 after coupon. The DVD was priced at $15.96. Target reportedly has the Blu-Ray/DVD combo pack priced at $24.99 THIS WEEK ONLY!